When an emergency strikes, it is critical that no matter where they are in your organization, everyone receives potentially life-saving notifications quickly and clearly. The Alertus Mass Notification System has you covered with its advanced technologies for mass notification and crisis communication—reach your entire organization at the push of a button. Alertus’ network-based approach to mass notification is key to helping you overcome communication challenges. By utilizing your IP network, Alertus can transform your VoIP phones, computers, digital signage, and other network-connected technology into intelligent devices for instant communication throughout your entire facility. Leverage your indoor, outdoor, and personal devices to create a layered notification approach to ensure you reach everyone, everywhere, every time. We don’t believe in a one-size-fits-all solution. In fact, we build custom systems to fit each of our customer’s needs. This also includes integrating any existing systems and technologies to build a single solution for sending cohesive alerts across your entire notification investment. The Alertus System will constantly monitor all of your alerting devices for accurate maintenance, reporting, and peace of mind. The Alertus System is designed to seamlessly integrate and leverage existing building systems and technology to provide building occupants and managers situational awareness and support business continuity. Learn how the we can help streamline your mass notification, situational awareness, and crisis communication plans by integrating with Life Safety and Fire Systems, Access Control, Building Automation, and Camera Systems. Alertus Technologies offers a customizable array of emergency notification products, including the wall-mounted Alert Beacon, computer desktop alerting, USB panic button, LED marquee display, text-to-speech interface for public address and giant outdoor speaker systems, fire alarm interface, VoIP phone alerting, digital signage and cable television override, and mobile phone alerting capabilities. The Alert Beacon attracts attention with sounder and flashing strobes, while a large text display informs building occupants of the emergency and instructs them how to respond. 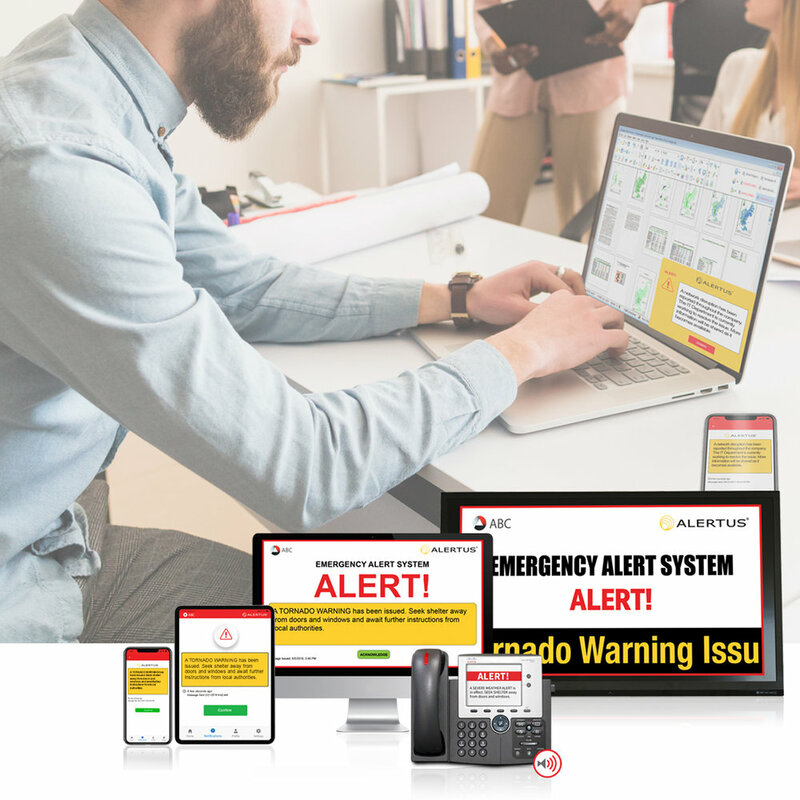 For more than a decade, Alertus Technologies has engineered innovative emergency alert systems for colleges and universities, K-12 schools, corporations, medical centers, military bases, and government organizations. Alertus System has been implemented worldwide by more than 2,000 organizations in multiple industries for a number of emergency situations. These may include armed shooter incidents, bomb threats, weather-related events, terrorist threats, chemical spills, or any number of emergency conditions. Alertus has been an industry pioneer, engineering advanced technologies in unified mass notification and emergency communication. We serve thousands of global customers in the higher education, K-12, industrial, corporate, healthcare, government, and military sectors. Our system has been activated in countless crises and is proven to save lives, protect property, and ensure continuity. Receive a customized review of our hardware and software solutions to best fit your facility. Expand your emergency notification portfolio by becoming an Alertus Certified Partner. Learn more about our solutions and the latest mass notification trends in the Alertus blog.